The NYK Group’s mission of “Bringing value to life” and the company’s basic philosophy of “contributing to the betterment of societies” has inspired the group to positively address the tough issues that challenge our society. In fact, NYK’s medium-term management plan includes the group’s intent to integrate environmental, social, and governance (ESG) initiatives into management strategy by establishing new medium- to long-term environmental targets. * To achieve these goals, NYK has teamed up with MTI and Elomatic, an engineering and consulting company based in Finland, to review the technical advances conceived for NYK’s previous concept ship (i.e., NYK Super Eco Ship 2030, created in 2009) and design an updated version that makes use of advances in technology in the realm of green and digitalization initiatives that embody the group’s basic philosophy. This concept ship has been crafted as a 2050-model pure car and truck carrier (PCTC). 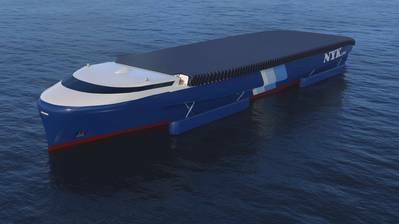 The power needed to operate the ship has been cut by 70 percent by remodeling the hull to decrease water friction, reducing the weight of the hull, introducing fuel cells for electric propulsion, and relying on other highly efficient propulsion devices. Instead of fossil fuels, power for the ship would come from solar energy and hydrogen produced from renewable energy sources, all of which would lead to a reduction of CO2 by 100 percent and thus result in a zero-emission vessel. The weight of the hull is reduced by optimization through a dynamic, mathematical design that uses lightweight materials for the superstructure. In addition, computer-controlled devices, such as gyro stabilizers, are installed to provide active stability for the lightweight vessel hull. An air-lubrication system effectively reduces the frictional resistance between the vessel’s bottom and the seawater by means of bubbles generated by supplying air to the vessel’s bottom. And automatic hull cleaning during port stays prevents any negative impact on vessel efficiency. Finally, propulsion efficiency is increased by replacing conventional propellers with flapping foils that mimic the movements of dolphins. The ship is powered by hydrogen fuel cells produced from renewable energy sources. Waste heat recovered from the fuel cells is also used. On long voyages, solar power can be utilized. Maintenance is managed through use of digital twins, a technology that realizes physical conditions digitally and enables real-time analyses from land offices, accident prevention, and optimal maintenance. Optimization of route planning is no longer a ship-level activity. It will be done at port and on a fleet level, which will enable just-in-time arrival throughout the supply chain. Automatic mooring and efficient ship-to-ship cargo handling will minimize port stays. The NYK Group will promote decarbonization through technical development that contributes to energy savings and greenhouse gas (GHG) reduction. By applying this to actual vessels, through the concept of NYK Super Eco Ship 2050, the company will continue to contribute to the sustainable development of society and enrichment of the group’s corporate value. NYK’s reduction targets for GHG emissions are 30% per ton-kilometer by 2030 compared with a 2015 base year, and 50% per ton-kilometer by 2050 compared with the same base year. The NYK Group will make its best efforts to reduce GHG emissions by increasing the efficiency of fleet allocation, vessel operation, and cargo handling; striving to achieve zero downtime; and realizing visualization and optimization through hardware innovation and digitalization. These targets have been recognized as science-based by the international Science Based Targets (SBT) initiative.